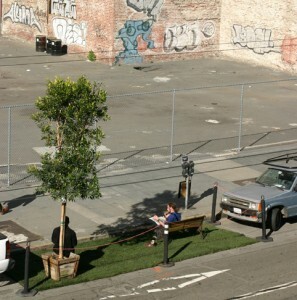 The original Park(ing) Day exhibit by Rebar in San Francisco, 2005. Image taken from http://parkingday.org/about-parking-day/. Park(ing) Day, a day to really challenge the idea of what Urban Space should be. In large metro areas, like that of a downtown metropolis such as Las Vegas, there seems to be a lack of "public space." Yes you may say that Freemont Street or any other places like that are considered public space, but they aren't. Freemont Street is owned by the casinos, and as such they can make the rules in order to better their own businesses. So then in such a large metropolitan, developed area, where can there be any "public space." Well how about a parking space. That's right a parking space. In order to bring awareness towards the idea of how precious space is in a developed area there is an initiative called Park(ing) Day in which someone can pay for a metered parking space and create a small park within that space. The challenge is to create an interesting and attractive space that can draw people to be outside, and understand that space is precious in a developed urban setting, like that of a downtown area. This is why it is called Park(ing) Day, we are literally Parking a parking space. What I have thought of is how to create an awareness of space in such a small amount of space. A normal metered parking space is 9'x20', which isn't much space to develop an awareness of space. But in order to bring up the idea of how to create more public space in an urban setting, we must start off with the small, and develop bigger. As such Park(ing) Day is perfect to showcase how important space is in Las Vegas.